I’ve been dabbling in game design again. It’s just one of those things that I do to keep myself from stressing too much, and since this whole “being unemployed” is really stressful, well, I’ve been doing a lot of creative things to destress. I suppose I could have played more games to get through my backlog, but creative pursuits just seem more wise in the long run, since there’s at least some potential to make some money to pay a portion of the bills. That’s part of why I did the Tinker Gearcoin Kickstarter. It turned out really well, so thank you, all of you, who were a part of the campaign! Despite the pretty numbers that we posted there, it’s still not a career replacement stream of revenue, though, so I keep on creating. 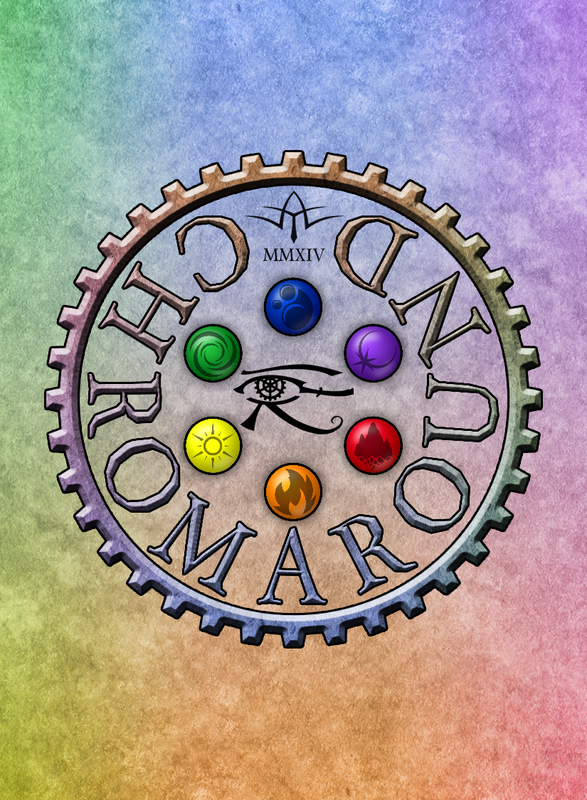 Anyway, this Chromaround game may someday turn into a project that we put on Kickstarter, just to get them professionally printed on spiffy paper, complete with a nice box and shrink wrapping. We may put them up on TheGameCrafter.com before that as well, like we did for the Tinker Deck prototypes, but the whole point of taking it to Kickstarter is to get a bulk deal going to leverage the economy of scale that we get from printing a large quantity of decks. For the moment, though, we need to really put it through the wringer and playtest the game to make sure it’s ready for release. I’ve ordered some sample decks from Artscow.com for testing here, and I may send some out to other interested parties. We’re also offering this “print and play” version of the game (again, like we did for the Tinker Decks). It’s technically based around color, so printing in black and white won’t give the full effect of the game, but I’ve tried to make it possible to work for colorblind players with the elemental logos. Rules for the core game are below. This is where we really would love some input, if you’re up for some experimentation. 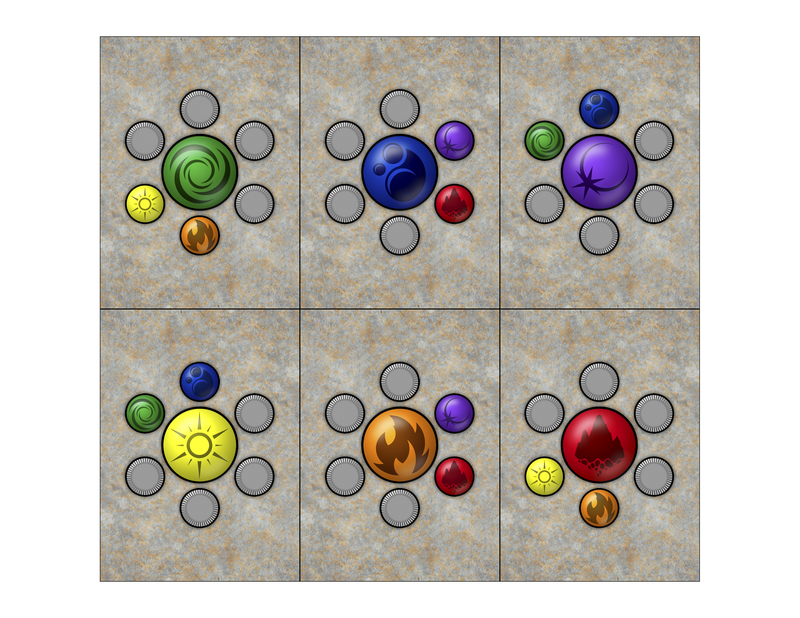 These cards could be used for several different games, actually, especially if we make them hexagonal and have the outer gems sliced in half (so they could be placed side by side to create a whole gem, making for puzzles and position-based games), but for now we’re just looking to develop this one. 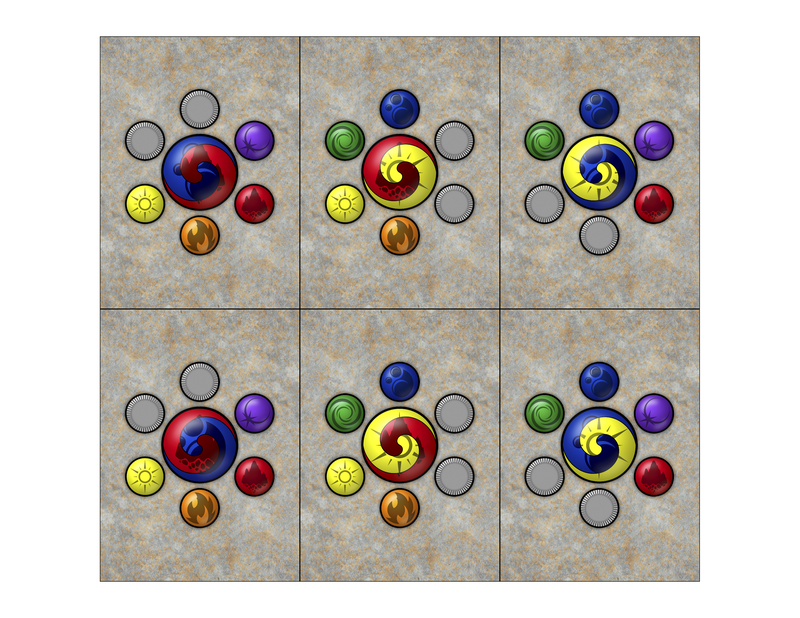 (The game is playable by 2 to 8 players, though there are special rules for two players.) Words that are bold are key terms for the game. 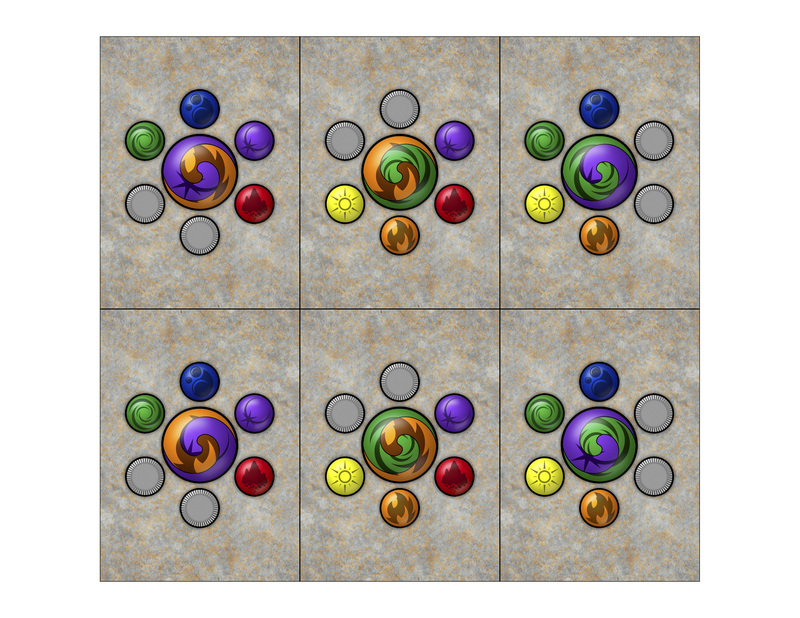 Each card has a Core (large colored gem) that consists of one or two colors, and a set of smaller outer Gems that indicate what colors of opponent Cores that card can defeat. A dual color Core is considered to be both colors, and therefore may be defeated by any other card that could defeat either of its colors. The grey “chips” around the perimeter are placeholders and do not affect either offense or defense. 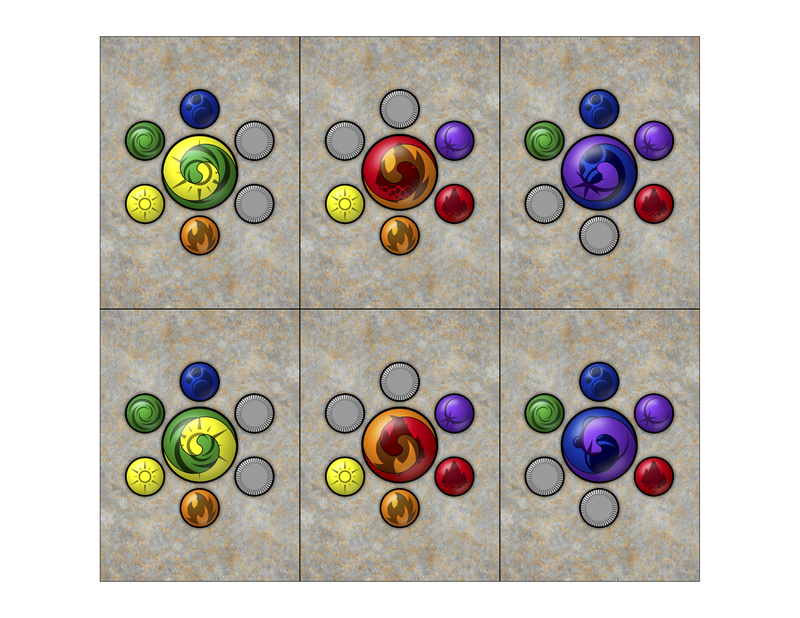 Each color has an attendant elemental logo to help identification, especially for color blind players, but these logos do not have a direct impact on play in this game. A round is completed when all players have exhausted their hands. A game may consist of one round or several, depending on how long you’d like to play. We suggest letting each player be the dealer once (change the dealer each round) as a simple baseline. Record your cumulative score after each round. The player with the most points after all rounds is the winner. Set aside the rest of the deck. The rest of the deck is only used during play in a two player game. The player who took the trick starts the next one, playing the next lead card (or card after the lead card if playing with two players). Once all players have played all their cards, it is the end of a round, and you should record your scores. And that should cover it. It’s designed to be fairly simple and quick, at least before you start trying to plan a few plays ahead. We have two big structural questions beyond that, though. This was a simple rule to allow for some element of memorization and planning, to see if it’s possible to force others to play into your longer term strategies. Two, do the dual color Cores help or hinder the game? 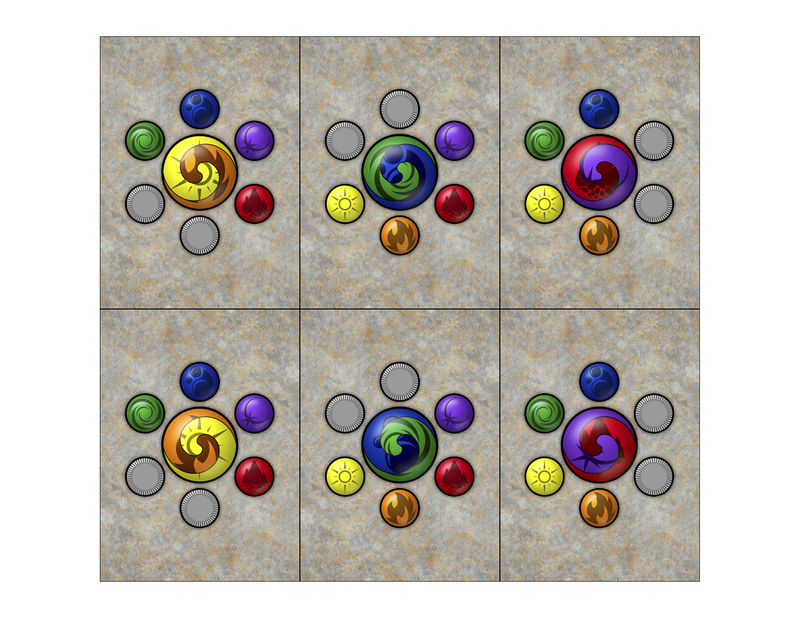 There are some clear tiers of efficiency among color combinations, but dual color Cores might make the game too easy, meaning the last player in a trick is almost always going to be the one to win that trick, since most can defeat a wider array of other Cores, and each in turn can be defeated by a wider array of attackers. The hope was to make the game more varied but still allow some planning, but they may not actually be performing that function. They also make scoring more varied, with some more subtle decision making about when to play them, but maybe that effect is also not working, or is not interesting enough. If the answer to the first question is “yes, make the perimeter gems more arbitrary and unpredictable” it would naturally affect the approach to the second question, as the cards could be balanced along different lines. The dual color Cores are inherently a “more options on offense and more weaknesses on defense” sort of system, but they need not stay that way if the color defeat cycles are broken. Thank you everyone for your interest and feedback! Comments here or via email to tishtoshtesh at gmail will be most appreciated. I can’t help but feel that there’s something here, but the game really needs to be put through the paces to see. I look forward to any opinions or data points you might offer! The deck is designed as a standard-ish 54 card deck. 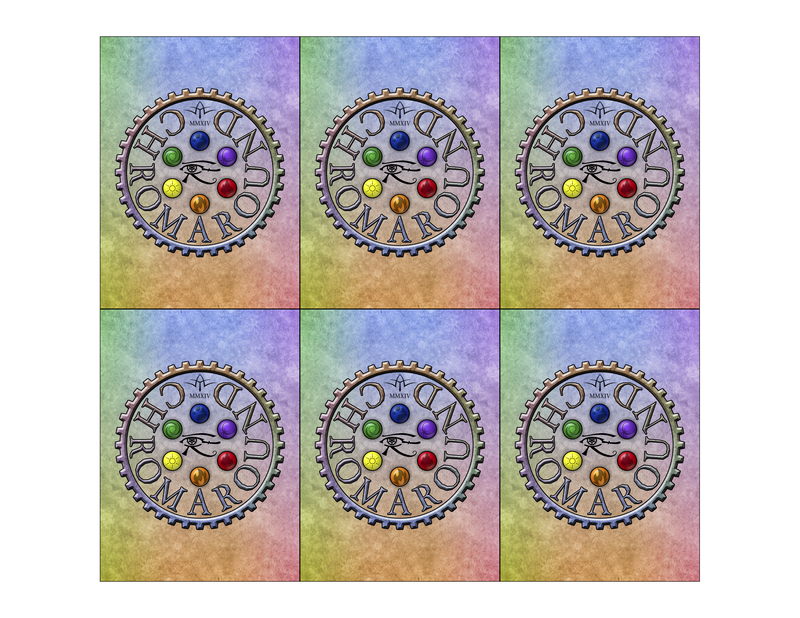 That means you’ll print one of each of these and then three more copies of the simple single color Core cards (so there will be four copies of the single color Core cards and single copies of each of the dual color Core cards). The backs are optional, of course. 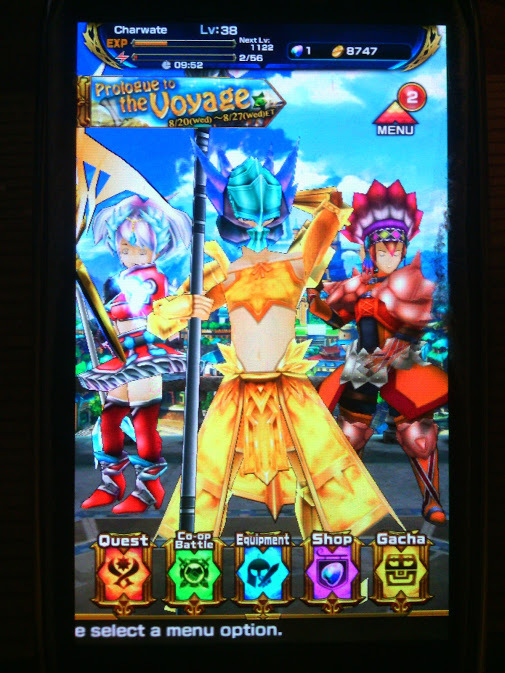 I’ve become fond of Slingshot Braves, an Android game that’s a nice mix of Squids (another good game) and billiards, with a little Final Fantasy VII flavor thrown in (with their Elements, a sort of materia or socketable gems character enhancement system, with some locked, some open slots). It’s not a perfect game, but it’s fun and entertaining, though I may be biased since I love the geometry of billiards. Throw in a bit of character building, and I’m sold, much like how I’m a fan of how Puzzle Quest takes match-3 gameplay and adds RPG elements. 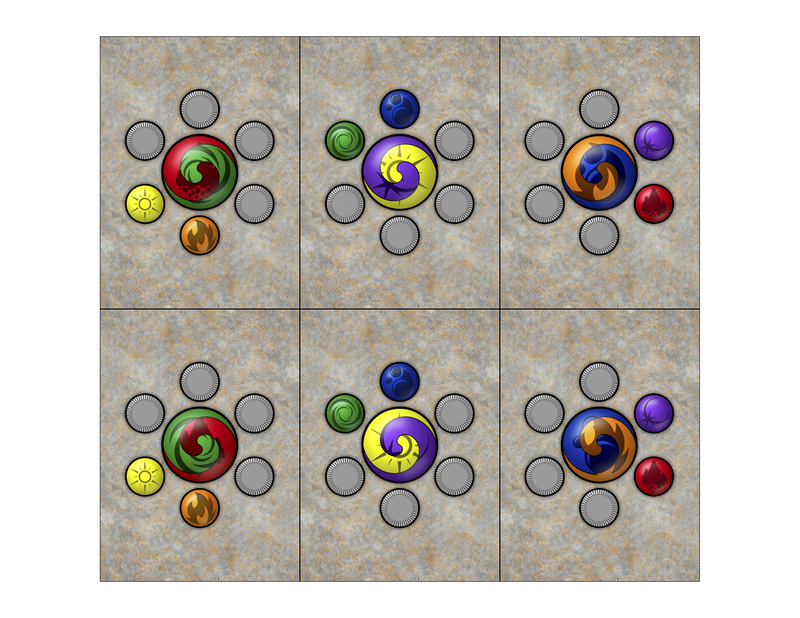 Tangentially, Gem Spinner II is an excellent match-3 game that I stumbled across recently. It’s my new favorite in the genre, even over other great games like Puzzle Quest, Marvel Puzzle Quest (qualified) and Bret Airborne. Slingshot Braves even starts you off in proper Metroid tradition, with super strong characters fighting a dragon… then pulls you out of the daydream and into the life of a lowly Adventurer. Yeah… the story isn’t the game’s strong point. It’s not bad, it’s just thin, but I don’t mind. The play’s the thing. You control a team of three characters, two of which are active on the battlefield at once. The third sits in reserve, where they can heal, which is handy if someone gets hurt. You can rotate characters out to approach tactical situations or heal up. There are five different types of weapons with different uses, though I’d note that spears are more tactically useful than the others due to the combo system. If you can keep a combo going by bouncing off of your teammates and baddies, you can really rack up bonus damage. Spears pierce through enemies (in fine RPG tradition), so they make it much easier to maintain combos when you can bounce off your friends, even if you’re surrounded. Using the touch interface, you pull back on your character and launch them at the enemies (all on a flat XY plane, no 3D gameplay here, though the game uses 3D models), which is the “slingshot” mechanic. If you can figure out how your unit’s round footprint will bounce off of other units’ round bases, you’ll have a lot of fun bouncing around the arena, smashing foes. The game shows you the results of the first bounce with a dotted line, but if you’re good, you can get two, three or more bounces plotted mentally, which can be really satisfying to execute. PvP won’t work in this design, being more or less “buy to win”, but at the moment, they aren’t bothering with PvP. So, there’s that asterisk waiting in the wings, perhaps, but I can hope that they are smart enough to keep away from PvP, or to normalize it if they introduce it, leveling the playing field. I suppose we’ll see. For now, though, I heartily recommend the game. Oh, and as to the “diversity” in the title, this amused me greatly. One of the recent armor sets in the Gacha was a really great set, with a Counter ability (automatically hit back for 10x damage received in melee) and a health regeneration ability. Either alone is worth its weight in gold, but both on one piece of armor, well, that’s borderline overpowered. Of course, it’s about the skimpiest armor in the game, which is ridiculous… but at least the design is almost equally ridiculous on both genders. Yes, that’s my lead character with a Predator/Optimus Prime helmet and a Las Vegas dancer outfit. Even his companions, in silly gear of their own, can’t really look at him. But it’s his best gear!